God has created a Perfect Universe. There should be conformity with the law of nature and no contradictions. Law of nature means that one should live a life within the rule of nature ,ie not to misuse natural resources for personal gains, Therefore, lead a simple life by limiting unnecessary luxuries, and develop a hobby of selfless service to balance the material and spiritual needs of life. The balanced life is a happy life. The laws, nature, and properties of matter and the soul are propounded as they are to be inferred from the order of nature as fixed by God. Using excessive resources or energy from the nature means one is creating a great sin by not allowing the future generations to enjoy the natural life. One who enjoys the gift of celestial controllers without sharing with others is, indeed, a thief. 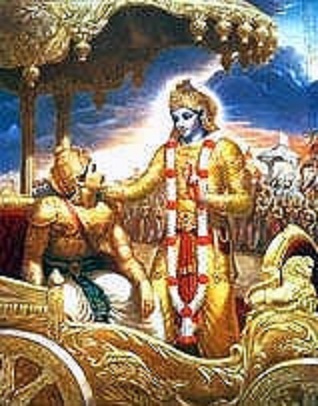 Gita " Self-knowledge and realization is actually understanding and living in accordance with the above principles. (3.12) Ignorance,lack of knowledge, selfishness, greed are the reasons of being living a unnatural lifestyle. As Gita refers to ignorance as man's geatest enemy, Belief in god means he will get you knowledge that can be used to live a balanced life within the text of Karm Yog, otherwise knowledge is good as Zero, knowledge is about practicing it in life not just telling people how to live. Nothing is said that is opposed to the laws of nature, reason, the evidence of direct cognizance, the teachings of the highly learned altruistic teachers (sages) of humanity and the intuition of pure souls. Puja for moksha or to attain god is not just enough, but living a life within the content of vedas is the actual knowledge.Thats why Bhagwan Krishan mentioned in Geeta that a person doing everything for this own benefit (including for their family) is a Paapi (sinfull person).Offering and believing in god means living a lifestyle also as perscribed in the vedas. (Taking care of nature and natural resourses for the future generations). Whenever a creation took place, the Vedas also became manifest, and when the universe was dissolved into its primary atoms, they disappeared into the Supreme, like unto the germ of a plant disappearing into its seed. There was no science and art of which the rudiments of ethics, morals and science were not to be found in the Vedas. Sacrifice speaks Through the act of the ritual. All actions should be performed as a Yajna in a spirit of service and sacrifice. Every man born in this world should engage himself in his stipulated duties as a token of gratitude to God and this will keep the wheel of the world moving while taking care of the nature and taking into account the world welfare, not just looking a family needs. We are indebted to God every minute of our existence in this world. The earth, air, fire, water and ether are His gifts and we live by them. The deities that preside over these elements and the gods that control them provide us with the food and drink and activate us. In return for all these bounties enjoyed by us minute by minute, we should realise that we owe Him duties and whatever we do, we should dedicate that to Him, as the Lord of this universe. We are all required to act strictly and conformity with the law of nature or law of God. Yajnas keep the life cycle going. The good and evil deeds performed by us produce good and evil results on nature also. Good deeds ensure prosperity and they ward off evil. Nothing is hard to do if we want to do. All our deeds have some invisible effect upon nature. Atomic radiation is invisible to the human eye but it causes great harm to those who are exposed to it. Our scriptures say that good deeds performed by us affect nature invisibly and there are no reasons to deny them. Some may argue that all around us sin is committed and injustice is perpetrated but still rains come and crops grow. Note, Agni is a manifestation of BRAHMAN or Iswara in the veda. Agni in the male aspect is Shiva, and as female is Shakti. The Agni-jwala (flame) is called Shiva. The common symbols (e.g., long or stubby ling or symbol) for Shiva and Shakti are just solid images of Agni (Yajna fire). Incidentally, Shiva and Shakti always appear together -- perhaps due to their common association with Agni. Moreover, Agni is also probably the biggest destroyer. Thus the connection between Agni and Shiva as the destroyers can be seen. On the other hand, Shankra is the greatest among Rudras; and Rudras are destroyers. Thus Shiva (through a connection with Agni as the greatest destroyer) probably, in His destructive aspect at least, is also identified with Shankra (the greatest Rudra destroyer). Note, Agni probably also is the origin of a number of other dark colored gods (idols), where their color corresponds to dark (black) colored ash (associated with fire or yajna). There are two unfortunate developments in the world today . One is that of the Brahmins giving up Vedic learning and Vedic works and the second that of other communities are not doing there own karm as defined in vedas. Not performing the duty that belongs to us by birth is an offence. But, as the Lord says in the Gita, to take up the duty of another is a greater offence. It is better to die within the sphere of one's own duty than to take up another's duty. Perilous and fearful is the duty of other men. A Brahmin who does his duty for a fee or charges ,or with a intent for money is a greatest sinner and losses his status as a caste of brahmin. A brahmin must engage himself for yagnas for the benefit of the society .The welfare of the Brahmins is the responsibilities of the other castes, now days both is not happening. Karm Kand, Grah santi pujas are for personal benefits only for individuals not taking into account about the world around us and its welfare. No one is providing for the Brahmins so karm kand for them is to establish their family welfare and no yagnas are performed routinely for the welfare of the society. No one group is doing their responsibility for mankind, to generate energy which improves health, farming, family welfares, divya energy to tackle the negative flow of energies in the environment and improve jnana for the whole community. For brahimans , Vedic Yagyas were part of the regular routine of individual and public life. They are mentioned often in the Vedic Texts, which describe their beneficial effects. The Vishnu Purana, for example, explains that: 'Performance of Yagyas day by day is beneficial to man and bestows peace' (1.6.28). What is Heaven on Earth? It is perfect health, a perfect way of thinking, a perfect way of doing. A perfect way of thinking means every thought will be appropriate for the thinker and his surroundings, and appropriate thought results in appropriate action and appropriate behaviour. There are no classes in the Vedas as far as the varnas are based, it is based on responsibilities by birth (as stated in gita). The responsibilities of other varna is to support the Brahmins to perform yagnas and the natural forces for a link between heaven and earth and the supreme lord, for better life on earth,stable environment etc.Everyone got the same responsibility to take care of the natural elements and support in the some way or the other.The Brahmins are to generate positive energy flow into the environment thru the blessings of the devtas who are responsible for the elements.The vedic mantras for yagnas can make the difference for mankind.-as the rishis used to do before. Where the sages out of mind to do regular daily Yagnas for the world welfare, it is the duty of the brahmins and other caste to keep the vedic rituals continued ( Brahmins to do the yagnas and others to contribute in it , and also look after the brahmins family welfare so they can be more involved in yagnas) and flow of energy back into the environment by the devtas thru Yagnas. Was the god out of mind to reincarnate to safeguard the Yagnas and sages. "KarmaYoga" means sacrifice, selfless service, unselfish work, meritorious deeds, giving away from your earning to others in need or Yagnas on routine basis. Therefore, lead a simple life by limiting unnecessary luxuries, and develop a hobby of selfless service to balance the material and spiritual needs of life. This can be achieved while been part of the society and not going out of your routine lifestyle. Karma yoga means living a life free of attachment ,desires and living with basic family requirements taking care of the natural resources around us. Some people often get confused like Arjuna and think that leading a life devoted to scriptural study, contemplation, and acquiring transcendental knowledge may be better for spiritual progress than doing one's worldly duty. This life style is part of the whole life, your regular earnings derived from the nature must be sacrifice to cleanse your karma or you are a thief of the nature whereby don't have authority to use the natural resources available to generate money for your luxurious lifestyle and for your own needs only. The nature and natural resources are there for the basic needs in life and not to damage it (directly or indirectly) for your or your families benefit. The Question is are we misusing the environmental resources, are we giving anything back to get timely rain, to improve air pollution ,to reduce sickness ,to improve water quantity and quality, and not leaving anything for the generations to come, that means we all are very selfish nowadays. Look at the items around us, everything is from the nature.Our needs and demands are creating industries and pollution. Every one is busy making money at any cost, we say the Ved is our supreme authority but we dont following it, neither does the religious leaders advice about the relationship between the nature, god and the people which in the vedas is supreme bhakti. Prayer means you can request god to nutralize the ill effects of the enironment for the benefit of the society for now and in future. Jap or meditation is the road to jnana, means people will use the jnana in daily lifestyle. These used to be done living a simple lifestyle, (not misusing luxuries), then only it counts towards your karma.Same with Bhajan and Kirtans meaning that the source of jnana will open from inside and get people to live a simple lifestyle to meet the needs of families basic requirements only. These are all defined as yagnas only if you live in accordance with the vedic or simple lifestyle.You can consider yourself as a contibutor to the unstability in the world disasters as you are using excessive resources for your family welfare which you dont have any authority for.You must respect the natural forces and the world welfare, not just your families excessive needs by means of lust, greed and in the name of false future security and welfare etc. In gita Bhagwan Krishna says" a Karma yogi will not use resources for personal gain but will think about its effect whereas a normal person will do anything for personal gain. Knowledge is using the information to positively analyse the needs of a simple life. Knowledge does not mean that you are a advisor only ,but what you practice is knowledge. Lots of parvachans take place yet people go back into their own flow of life of creating their own wealth and welfare hence being ignorant about the "sristi chakra". People who have knowledge are not ready to sacrifice their time to really do things more practically but just to advice. If everyone only advices then who is going to do it. Family welfare must be taken into account but within the limits of the natural elements. ie to meet the basic requirements in life and not using excessive resources from the nature. Housing requirements are minimized by keeping the family together and happy. Not that only two people are living in a house capable of taking eight. Keeping people happy and worry free means that the energy and food from the nature is used less and the negative flow reduces hence providing a healthy life. Yoga is all about using and optimizing the the right amount of energy for survival and continuing to live a happy lifestyle. Taking care of families / parents, meaning both the parents and us enjoy life whereby the natural elements are used less and that the vedic principles are followed about the nature, ie the generations to come can use the environmental resources too. -Science proves that laughter uses less energy then being unhappy or angry. That is why it is highly recommended to live a sanyas life during the old age so the burden on the system is minimized (not to have over expectations). Means that 1 house is enough to cater for everyone with minimum resources being used.Ofcourse parents are to be given extra care both as difined in veda as they have given as birth to us and we owe them hugely for that. As a parent now it is also your responsibilities to look after your diets , not that consuming that everway you wish and enjoying liquors etc, and later in life when you get sick ,you blame the kids only for not taking care of you. Know it is our responsibilities to live as defined by the vedas so later we are not burden on the system, That will mean that we are misusing our rights too. When people live a balanced life (as defined in the vedas) during the young days then it takes the burden off the old age (free of major sickness )and everyone lives happily. Lack of energy or misuse of energy from the environment means increase in diseases and other natural human problems occur during the other times of the life. When people are gelous, greedy, angry that means you continue to think about others or something that means that you are wasting the energy. Why waste energy for someone or something for nothing , You are actually affecting your bodies health. People during their prayers can ask god for pleasures but within defined limits of natural flow - For family welfare ,for kids , for knowledge ,etc. First they must appreciate what they have before asking. The great level of happiness, the god has provided is within the natural flow of life with the family which nowsdays have no values it due to selfishness of the people. (as in Mahabharat). Life security nowadays is money, thats what people feel. There is no limitation for one not to enjoy in life, enjoy naturally -picnics, with families, with friends, playing games, watching sports but remember not to misuse the resources. Everything nowadays redefined in the name of progress and development. What is the use of providing for the poor when we are creating it ? what is the use of helping sick people when we creating that sickness ? what is the use of praying when we damaging the nature (natural forces) for your benefit ? The negative energy is creating sickness like cancer, mental disease,Lust, anger, selffishness, disability, financial and social stress, negative thinking and actions. To identify the root of the problems are very important. Selfishness is the biggest problem in society, Puja for self benefit, Making excessive wealth, living a luxuries lifestyle regardless the cost from the nature etc. People should use their resources to a point whereby life is happy and minimizes the use of natural resources for their family welfare. Everyone in the society is frightened to break the barrier, and come out of the current social life style. Everyone is busy making money, and improving a false family welfare that in time to come will not exist for your forthcoming generations. 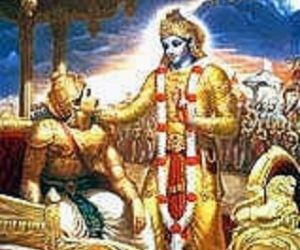 Bhagwan Krishna says in Gita " anyone not supporting/help in running the sristi chakra (life cycle of the universe) is committing a sin -and thats why everytime the Bhagwan came to earth to safeguard and support the sages to continue with vedic Yagnas and provide sat gyan so people come out of selfish deeds. Based on the theory of Gita , people are reborn, means that when you come back to this world after 30 or 40 years from now, imagine what the world would be like, full of false intentions, false marketing, diseases and sufferings and thats what you are leaving for your Kids. The above issues a preventive measures for you, your family and your future generations. People are ignorant, they dont want to know about it.